Woolf’s first novel and the first one I’ve read of hers turned out much as I’d expected. She comes across as a 20th century Eliot, full of erudite wit and wisdom of what the world, and humanity, is all about. I’ll have to read more of her before I form a full opinion though. 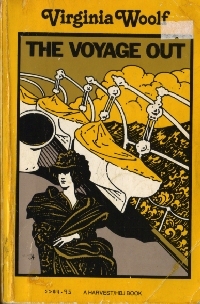 This novel reminded me of someone heavily into E.M. Forster trying to mate A Passage to India with A Room with a View so similar were some of the scenarios and the characterisations. But whereas, Forster’s books deal more with the interaction of cultures and the strain this puts on relationships, Woolf focusses entirely on the relationships. The book is populated with some of the most self-obsessed people I’ve ever encountered on my literary journey. There wasn’t one single character I liked or felt an inkling of sympathy for. Nor could I care much what happened to them which took the edge off the major events in the plot. At times the writing was a bit melodramatic and overindulgent in a way very reminiscent of Eliot’s Middlemarch. So, while the writing was well-crafted on the whole and, for a first novel, very good, I didn’t enjoy it much. As the streets that lead from the Strand to the Embankment are very narrow, it is better not to walk down them arm-in-arm. She looked foward to seeing them as civilised people generally look forward to the first sight of civilised people, as though they were of the nature of an approaching physical discomfort – a tight shoe or a draughty window. teetotum: A small spinning top usually inscribed with letters. I love Woolf, but I haven’t read this book. What is this 1001 books tag? Is there a list somewhere? I like how many categories you have. I’m getting ideas from other blogs, and I think the tag cloud and the large number of tags is something I might borrow. I have to find the tag cloud widget before broadening my topics, because a list would take up the whole sidebar. Thanks for the link to the list! From what I’ve read about Woolf her writing grew increasingly experimental so going through the rest of her oeuvre should be a different experience (although I don’t know how different, until you get to Mrs D).